When I mentioned to some of my friends that I am going to Huhhot in Inner Mongolia China, their imaginations brought them to airport transfers by horse-drawn carriage, Mongolian Yurt-style hotels, grasslands and all kinds of interesting images about Huhhot. The reality, however, is far from what they have imagined. Huhhot is a modern city (albeit crowded with lots of traffic jams by cars not horses!) and our airport transfer to Shangri-La Huhhot was via a Audi hotel limousine (with Wi-Fi onboard!). The grasslands and Mongolian yurts still do exist but are located more than 2 hours from Huhhot and we checked them out as part of our Shangri-La Huhhot Grassland Experience (more about this in the next post). Inner Mongolia is a diverse region of forests, deserts, mountains and grasslands, and has a minority culture. Huhhot, meaning “green city” in Mongolian, is not only the capital city but is also an important cultural and commercial centre of Inner Mongolia. To get to Huhhot from Beijing, you can choose to take a short 1hr 15min domestic flight or an overnight 12hr train. 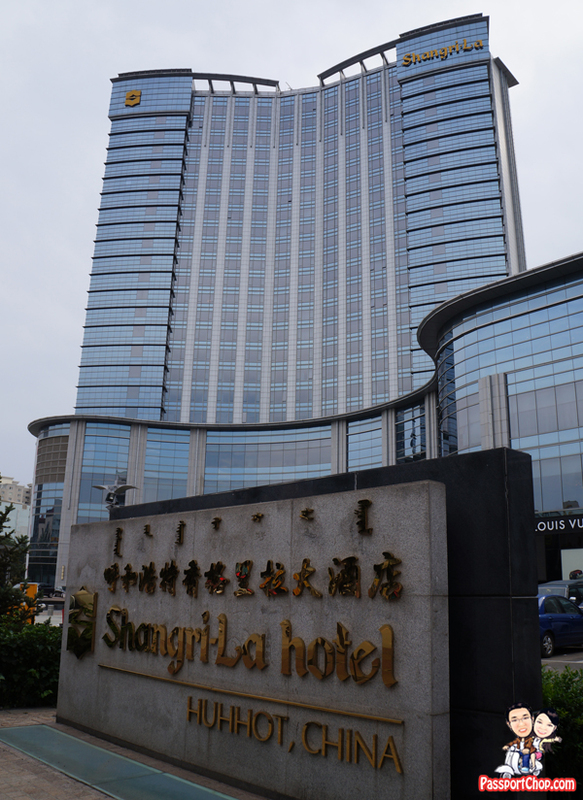 The service standards at Shangri-La Huhhot is just as high as with any other Shangri-La in Singapore, Beijing, Shanghai etc. 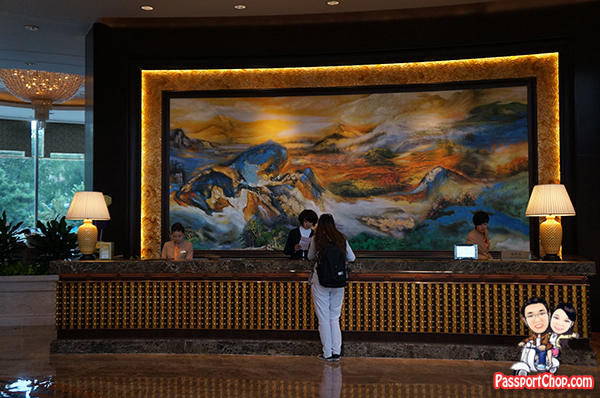 We enjoyed the same consistent “Shangri-La experience” here at Huhhot from the friendly Shangri-la representative at the airport to the quick private check-in service for Horizon Club guests. 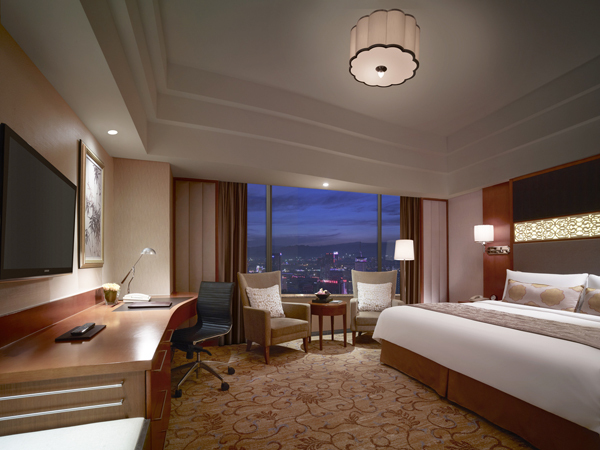 Shangri-La Hotel, Huhhot features 365 luxurious guestrooms and suites designed in contemporary style, as well as 11 spacious serviced apartments. The hotel offers a luxurious environment with modern furnishings and relaxing colours. Do note that most of the floors at Shangri-la Huhhot allow smoking – there are only a few non-smoking floors so do indicate your preference when you book your room at Shangri-la Huhhot. A line-up of considerate facilities and fashionable furniture ensure guests comfortable and convenient, such as full-sized ergonomically designed executive desk, and separated bathtub and shower. To add to the guests’ ease, all rooms are equipped with complimentary wired and wireless broadband Internet connectivity. The lushness of the Shangri-La Huhhot Deluxe Room (for Horizon Club guests) extend to the bathroom which has marble flooring, a spacious bathtub (as well as rainshower facilities) and also premium Shangri-La toiletries. We stayed at a Deluxe Room (38 sqm/409 sqf) which offered an excellent view of the nearby picturesque Qingcheng park. One unique feature of the rooms at Shangri-La Huhhot is its ceiling – referring to the picture below, you can see what appears to be multiple tiers of concentric ceilings – this is reminiscent of the ceiling of a traditional Mongolian Yurt. The lamp on the ceiling is shaped like what’s shown in the picture for a reason – it looks like a cloud which is a typical Mongolian symbol! If you are here in Shangri-La Huhhot, try to spot some of these Mongolian symbols around your room and the hotel *hint* – look out for interesting artwork. It is these attention to details that made staying at Shangri-La hotels around the world interesting – unlike hotel chains which copy and paste their designs throughout their properties, each Shangri-La hotels differentiates themselves in their own ways while retaining the quintessential “Shangri-La experience”. We had raved about Shangri-La Huhhot 呼和浩特香格里拉大酒店 Shang Palace 香宫 Chef Menex’s cooking and his signature dish – Rice Crispies Sizzled in Tomato Seafood Soup “海鲜霹雳泡饭” in an earlier post. Besides Shang Palace, another restaurant that guests (non-guests too) at Shangri-La Huhhot can check out is the Xin Cafe. Xin Café takes its guests on a culinary journey through an impressive variety of cuisines from around the world. The Xin Cafe feature an open theatre kitchen concept – the first of its kind in Huhhot. At the 10 open food stalls, chefs use local and foreign traditional ingredients to cook the food instantly to retain its original fresh flavours and present a range of rich international cuisine. Guests at the Xin Cafe can also check out the various kitchen equipment and appliances used to prepare the various cuisine, such as the Indian tandoori oven, the traditional pizza oven, Brazilian barbecue pits, a Hele noodle machine with a long history and an Italian traditional manual ham shavings machine. You can’t get a more authentic dining experience than this! 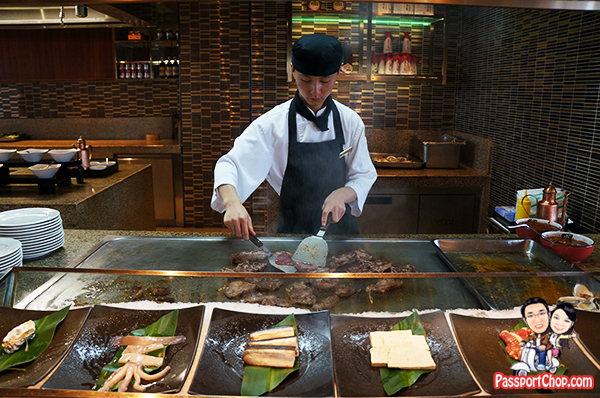 The fiery Japanese iron cooking style is used at the Japanese Teppanyaki stall, where different types of meat, vegetables, shellfish and seafood are available. At the Seafood Sushi stall, a variety of sushi, hand-rolled sashimi and Japanese cuisine are made with seafood ingredients such as Alaskan king crab legs, mouth shell, deep-sea blue, Canadian jade snail and Hawaiian scallops. At the India stall, chefs from India, uses the Indian cooking concept of “simple ingredients + condiment + cooking style” with a traditional clay furnace and adds a variety of complex spices to present authentic dishes from India. The Brazil BBQ stall offers a wide variety of food complemented with barbecue sauce. The Pizza stall offers pizza baked on-site and thin tortillas sprinkled with an array of mushrooms, onions, green peppers, Italian ham or sausage, crisp on the outside. The Chinese food area brings together Huaiyang cuisine, the most welcome of the eight major cuisines in China, with that from Sichuan, Fujian and the local Mongolian dishes to show the essence of 5,000 years of Chinese cuisine. The Guangdong roasted meat area presents guests with roasted goose and pork pickled using a secret sauce. Daily selections of noodles are available at the Noodle stall, from traditional Hele noodles to delicate pastas. 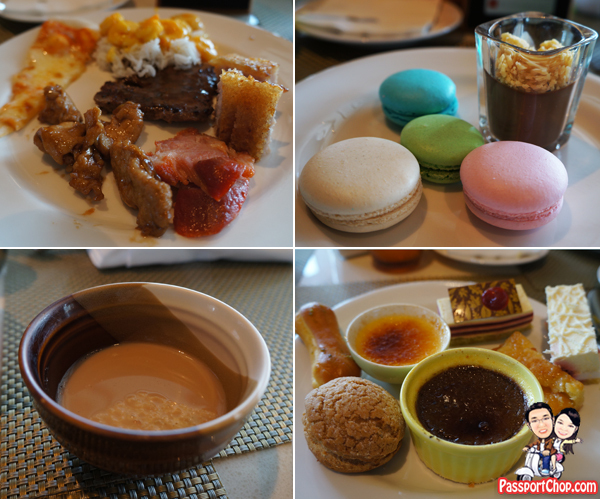 The dessert selection at Xin Cafe is one of the most extensive spread that we have seen (even by Singapore standards) – here you find all kinds of desserts from chocolate mousse cakes, creme bulee to different flavored macaroons. Horizon Club guests can also enjoy complimentary buffet breakfast, all day refreshments and snacks, and evening cocktails and canapés at Horizon Club Lounge (on the 21st floor). 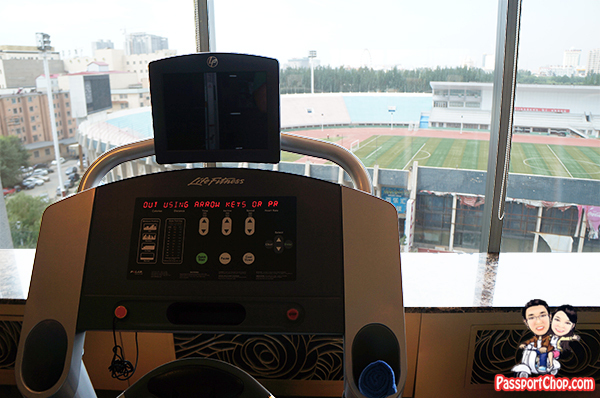 Shangri-La Huhhot’s Health Club offers sauna, jacuzzi and a well-equipped gymnasium. This provides an ideal place for guests to refresh and re-energize and also to work off all the calories gained from the sumptuous buffet spread at Xin Cafe and yummy dishes by Chef Menex at Shang Palace! 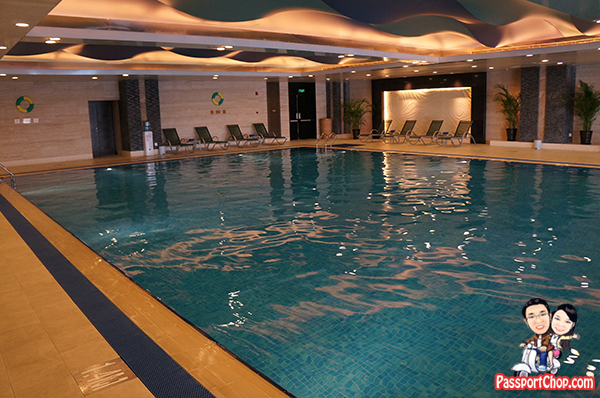 There is also a 25-metre indoor swimming pool at Shangri-La Huhhot. Do note that you are required to wear a swimming cap if you want to swim at the swimming pool. Located in Huhhot’s business district and enjoying serene views of Qingcheng Park, Shangri-La Hotel, Huhhot is the city’s first international deluxe hotel. Shangri-La Huhhot is the ideal base for both business and leisure as it offers easy access to the province’s most important commercial and government offices, shopping mall, as well as a variety of scenic spots such as Five Pagoda Temple, Zhaojun Tomb, Genghis Khan Mausoleum and Xilamuren Grassland. The hotel is just a 25-minute drive from Baita International Airport, and is only eight minutes from the Railway Station.